All M2M amplifiers and repeaters listed below are compatible with your Virgin Mobile Canada service. Virgin Mobile Canada M2M Signal Boosters for use in ATMs, lotto & vending machines, remote monitoring systems, etc. There are many areas that suffer from weak cell phone signal. We can move around and find a better reception, but what about M2M devices? It is not possible to move an ATM machine, etc. to get the cellular modem inside to access the Virgin Mobile Canada’s wireless network. Machine to Machine or M2M cellular connections are defined as technologies that allow wireless systems to communicate with other devices of similar kind to transfer data packets consisting of information. It may include industrial instrumentation that comprise of a device captures the event and relays it thru the network (hybrid, wired, or wireless) to a certain application or software program, which may translate a captured event in meaningful information. M2M has great things to offer but it will be useless if you have poor signal. This is why Virgin Mobile Canada signal boosters by weBoost must be considered to alleviate the problem. Security 4G M2M 471119 Machine To Machine Signal Booster For Security Systems. 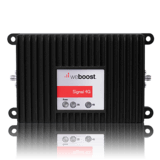 This weBoost signal booster is specifically designed to provide consistent strong cellular reception to security systems. Security panels may be connected to door entry system, alarm system and/or any other kind of the security environment. This signal booster can be installed and even connected to the equipment to obtain reliable 4G signals. This is designed for machine to machine installations with robust physical features with secure manner of communication. Signal 3G 470109 M2M Direct Connect Signal Booster Kit. It has the capacity of boosting 3G data signals to avoid patchy signals that may affect communication between wireless network connected machines. This signal booster utilizes bi-directional amplification to boost amplified signals from the cell site and sends them back. It is packed with technology that is proven effective in improving the signal strength. Please scroll to the top to browse all the M2M booster kits for use on M2M devices connected to the Virgin Mobile Canada’s cellular network. Choose the one that meets all the requirements of your company's machine to machine application.